The women's basketball team delivers E.A. Diddle's first coaching win on January 12, 1923. This photograph was taken in April of the same year in front of the Red Barn. 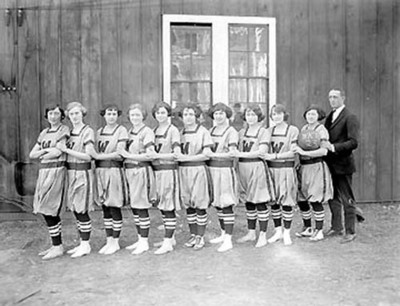 L to r: Matilda Davis, Gladys Knott, Louise Monin, Irene Caldwell, Elizabeth Wyatt, Julia Warner, Bernadine Conelly, Alma Davis, Frances Samuels, Bulah Snider and E.A. Diddle. E.A. Diddle first waved a red towel at a basketball game on February 16th of the same year.